Advanced Memory Systems have just released their Mouse for the Spectrum, which comes with its own interface and software on cassette. The Mouse interface allows you to connect a centronics printer to your Spectrum as well as the mouse and the whole caboodle is compatible with Art Studio, the graphics package which has impressed our in-house computer artxpert, Franco Frey. Trundling your mouse around a convenient, flat surface allows you to interact with programs running on your computer. The package comes complete with its own graphics programs to get you started, an icon designer and full instructions on incorporating mouse control in your own programs. 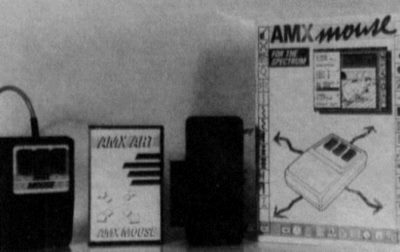 For the greater part of £70 (well, £69.95 to be precise), the AMX mouse allows you to catch you Spectrum by its bootstraps and move it towards the Apple Macintosh league. If you thought Icons were trendy, just wait till Mouse Mania grabs hold .... Full review next issue. Adapt Electronics are now producing an interface which allows you to connect a Spectrum to any RGB monitor, TTL or Analog, for £36.95 with a through port connector, or for two pounds less without the through port. Some early Spectrums will require three links fitting internally before the interface will get up and running. 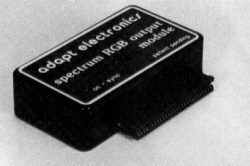 Most people should be able to plug the unit into their computer and hang a monitor straight onto the 6-pin DIN output onto the side of Adapt’s RGB interface. A new product arrives from the States, via Vulcan, who are marketing the Maze Master joystick in this country. For your £12.95 you get a nifty microswitch joystick which allows you to switch between 8 and 4 directional mode. For the price, the Maze Master represents good value if you want a joystick that offers fine finger and thumb control — and it should prove ideal for driving cursors around in Art packages as well as for games playing. Maybe it’s time we got another Joystick Review together... watch these pages! The RGB interface produced by Ferguson, the obscurely named MA20 allows you to display your Spectrum’s output on the screen of Ferguson monitor/tellies like the MC01. For a few pennies under £30 you get the RGB output together with sound and there is a Green Screen switch which takes you out of RGB full colour mode, making the screen of your Ferguson colour set emulate a Green Screen monitor. A socket on the side of the unit allows you to run one of the Ferguson, Green Screen monitors direct, if you so wish. The interface has been specially developed to run with Ferguson’s own monitors and TV’s — if you’re thinking about getting a monitor for your computer to make the most of its visual output, you should be able to pick up the interface and the MC01 colour telly/monitor together for around £200 if you shop around according to the man at Thorn EMI Ferguson. TIRED OF BEEPS AND SQUAWKS? Saga Systems may have the solution for you. Their Sound Boost is a tiny little doobrie which allows you to combine the Spectrum’s sound output with the UHF signal sent to your telly. Three straightforward connections have to be made to your computer’s internals — three wires are attached to the little circuit board which is the Sound Boost. Each wire ends in a tiny clip doobrie, which has to be connected over the appropriate part of the Spectrum — no tiresome soldering, no messy connector blocks, just follow the instructions, adjust the sound output and you can put the top back on your computer and listen to your telly rather than the onboard buzzer. All this for a mere £9.95. With a little care, you can have your Spectrum speaking loud and clear. The boffins at Mirage, flushed with success of their Microdriver have decided to launch a New Improved version. New features include an improved loading algorithm, which means that programs saved to drive can be loaded back into the Spectrum up to five seconds faster; a copy function that can be used to output a full 24 line screen to a ZX printer or Alphacom 32; optional display saving which reduces the file size on microdrive by 7K, meaning you can squeeze more onto a given cartridge; an enhanced POKE entry facility and a brand new DUMP function which gives access to the program in memory. The new version of Microdriver doesn’t come with a new price — it’s still £39.95 including VAT, and if you have a version 1.0 Microdriver and would like an upgrade, send your unit to Mirage and they’ll send you a version 2.0 model by return. Nice, Eh? The chaps at Duraplug have come up with a whizzo wheeze to save you spending lots of money on separate plugs for all the wires that emanate from your computer, Hi-Fi or Telly/Video units. MICRODRIVE DOCTOR GETS A Phd? Softschool have been adding a little polish to their Microdrive Doctor. The new version includes some new commands and a “much needed sector editor”, as the man said. Normally available at £6.50, you might like to take advantage of the man’s generosity and pay £5.50 instead. Only if you’re a CRASH reader, mind! Following hot on the heels of Interface III and the Mirage Microdriver, Romantic Robot have just released their Multiface I. As well as providing a composite video port the interface allows the user to “back up” software to tape, microdrive, disk drive and wafer drive. Unlike some interfaces Multiface I dumps the software straight out on to the desired storage medium without the need for special software. Once the software has been backed up you can load it independently of Multiface I. The actual use of the interface is very easy; all is required is that you load in your software and press the little red button on the top of the interface, then follow the on screen prompts. So far, we have found that Multiface I has coped with any game that has been chucked at it. Unfortunately it arrived in the office just too late for a full-scale, in-depth review — which will appear Next Niche. While the Tech Niche Team were at the Christmas Microfair, a Danish fellow came up to us and thrust a cassette into our hand(s). He was representing a new club that’s started up in the land of Lurpak, which aims to butter up Beta Disk users by sending them four issues of a cassette based magazine every year. To join the club, send the Danish Disk Doctors eight pounds in cash (or ten poinds by the way of a cheque) and they undertake to enrol you in their club and send the cassette mags. Apart from news and views, tips and hints and such useful things, the cassettes contain utility programs to help you look at the information on track 0 (and play around with it), sector editors and deleted file recover routines to name but a few promised programs.